Small businesses, formerly unable to enjoy the real benefits that CRM offers, are seemingly now spoilt for choice – there seem to be dozens of companies offering lightweight CRM specifically for SMBs – offerings from Zoho, CapsuleCRM are but a few of the multitude of offerings that exist. Today it’s the turn of a new entrant to the space, Future Simple, with its CRM product PipeJump to enjoy some limelight. Founded in 2009, Future Simple is focused on building simple software for small businesses. Its CRM product PipeJump, helps companies visualize their sales pipeline through a simple sales tracking application. PipeJump is designed for businesses with fewer than 100 employees. The idea of PipeJump is to greatly simplify CRM usage and, in doing so, to increase the engagement that businesses have with heir CRM. Employees can change deals between stages (incoming, qualified, quote, closed) and can track the flow of those opportunities through the pipeline as well as setting reminders for ales calls and the like. 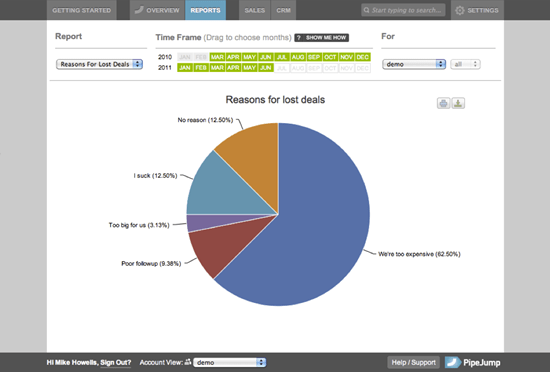 PipeJump also has an analytics angle – business owners can assess reasons for lost deals – like all these things PipeJump is only as good as the data that individual users put into it but the simplicity of the system should see a higher aggregate quality level. None of these features are earth shattering, but they’re all useful and will help keep PipeJump at the cutting edge, while further simplifying how the app can be used. PipeJump is priced from $14 per month. Nice UI. The small business space is pretty crowded these days, but… why does every CRM think that small business=service business? Thats why we build http://www.PeopleMine.co.nz, for retailers with a customer focus.